While I often talk about nuts and bolts of aircraft building, it is important that builders also have a ‘bigger picture’ to utilize the detail information within. Here is a look at why understanding the history of aviation directly benefits the homebuilding community. OK, what the heck do my last three stories: 10 elements of UK Aviation to admire , French Aviation to be admired. and Russian Aviation to Admire. have to do with Homebuilding? A lot actually. If homebuilding has one Achilles heel, it is that many of the designers have little understanding of, and no respect for, the fantastic engineering that has gone into all the other branches of aviation in the last 111 years. I love homebuilts, but many people who work in our industry and provide products, are willfully ignorant of history and standards of other branches of flight. Conversely, I have spent virtually my whole life, dating back to age 10 or so, studying everything thing I could about the history of flight. For the last 25 years it has been my profession, and the pace of my study has only accelerated. I bring this to my everyday work with the Corvair. Want some examples? Mick Mannock’s story from 1918 instructs that fantastic skill will not save poor decision making, and emotionally stressed people make bad decisions like clockwork; Michel Detroyat in 1936 demonstrates that just when you think you are pretty smart, know there is someone who can humble you with what they can teach; Yuri Gagarin reminds that it isn’t the highest risk act that gets you, it is the typical one you do with your guard down that does it. Those are simple examples. There are complex details of engineering to be appreciated also, But the largest single factor is knowing that as great as homebuilding is, its value lies in the fact you are doing it, in the arena, not reading about it. I hear arguments made all the time about how homebuilding is ‘cutting edge.’ I disagree, and have a lot of physical examples to prove it. But the real danger in claiming cutting edge status is adopting the mindset that you don’t have anything to learn from the rest of aviation. Conversely, I have watched a number of people selling alternative engines who claimed their “race car” backgrounds were more important than Lycoming’s track record, fail miserably, and I mean fail in the broadest sense, including getting killed. The emotional need to prove something is best left outside the airport fence; Physics, Chemistry and Gravity don’t care about such things and they don’t grant dispensations for the passionate. They only care what follows their rules. If it follows the rules, it will work. Wanting the rules to be different is a subject you can take up with God; break the rules and Physics, Chemistry and Gravity will provide you with the opportunity to have the conversation. I do not consider myself an aviation historian. It takes a lot more effort than I have put in to make that claim. However, I have no problem saying that in the last 25 years the only guy I have met in the profession of “aviation journalism” who had a far broader knowledge base than me was Bob Whitter. Putting Bob on a different level, I am comfortable saying that I know far more about the history of aircraft than any “aviation journalist” I have met. These people know how to produce magazines, but they often don’t know the background and history of subjects they are covering. Why this matters: Because countless times I have watched a new product introduced to journalists as ‘revolutionary,’ and the person writing the story bought it hook line and sinker because they didn’t know enough basic aviation history to know the concept in front of them either wasn’t new, or would never work. Many intriguing stories about ‘great’ products have been written this way. Unfortunately, the vast majority of the subjects disappeared, often with other peoples money. The easiest example I can think of is the “Carter Copter.” I personally watched many journalists taken in by Mr. Carters ‘revolutionary’ claims. When introduced nearly 20 years ago he said it would do 400 mph at 40,000′ and fly coast to coast, non stop. This was all published by Journalists who didn’t understand much about rotary winged aircraft to know they were listening to a story about Unicorns. Last time I saw Carter was 4 years ago, he was at the EAA chapter #1 open house in Riverside CA. He was the after dinner speaker, and he was trying hard to sell investment positions for his ‘New’ copter, which he said would shortly fly from Dallas to Paris France non-stop. Even at that time, there were journalists who still thought he was telling the truth. Had a single one of these journalists ever heard of a compound helicopter from 1967, the Lockheed AH-56 Cheyenne, they would know that the concept of a rotary wing plane that unloaded the lift to stub wings was nothing new. At Riverside many were impressed that Carter was said to have flown 172mph once. 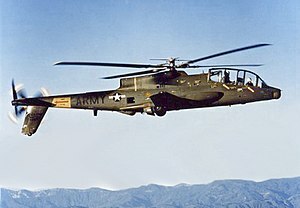 I was not, for 35 years earlier, the AH-56 had done 244 mph, while carrying many tons of weapons and ordnance. It held the speed record for rotary wing flight for almost 40 years. Today Mr. Carter has just landed another $2 million of taxpayers money. Lets hope he sends a thank you note to all the journalists who assisted him. Maybe this time he will reach more than 20% of the goals.